Mangage files easier from the cloud! Practical document management tools give your organization the power to truly go paperless. Need a better way to manage files? 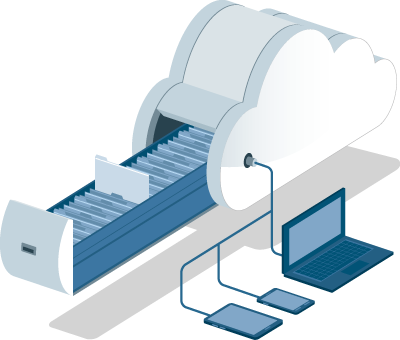 DynaFile's scan to cloud document management software provides a simple and effective solution for your office files. Scanning automation tools allow you to take an entire department paperless fast. Then, easily manage all of your documents from your online filing cabinet to segment access for different roles and ensure all folders are up-to-date with required files. Best of all, cloud collaboration features like esignatures and floating annotations let you take your workflow digital without missing a beat. Want to see how it works? Go paperless fast! Choose from three different methods to automate the conversion of paper files to electronic format. DynaFile's hybrid filing solution lets you manage paper as easily as electronic documents. Get organized! By consolidating your paper and electronic files in one secure location, finding documents just got a lot easier. Plus, since your filing cabinet is in the cloud, employees can access documents from anywhere, at any time. Cloud collaboration features let your team do business more efficiently from multiple office locations. Don't just share, do business! DynaFile's online collaboration features bring teams together like never before. Bring your review and approval processes to cloud and markup documents just like you would with pen and paper.